Hot water heaters came in various shapes in sizes. You would be suprised by the amount of different water heaters there are in the system, a true nightmare for someone who cannot make a decision. Luckily, every single water heater falls in a category that describes its general features and perks. Below is a list of most of the different types of water heaters you will encounter. Hopefully this may help you make a more informed decision on what you need. The typical electric unit is wired to a 220-volt circuit. To heat the water, the current passes through electrical-resistance heating elements—usually two, one at the middle of the tank and one at the bottom. Power is delivered to each element through a thermostat—a switch that senses the water temperature. When the temperature drops, the switch closes to allow current flow, and it opens when the temperature reaches its preset limit. Thermostats have a dial for setting the maximum water temperature—generally between 130 degrees and 140 degreesF, or as low as about 120 degreesF for increased energy savings and scald protection. 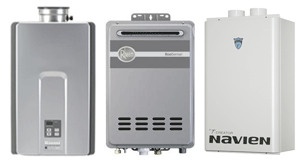 Instant hot water heaters, also known as tankless water heaters are usually the size of a suitcase. They heat water on demand, whenever needed, using an electric coil or natural gas. The water passes through the heat exchanger inside and gets heated using the heating apparatus. Hence, as a result, they eliminate the risk of tank failure and also cut down on energy lost which would happen due to reheating of the water, as done in storage-tank hot water heaters. What's more, they're expensive to buy and install, and include limitations on hot-water flow rates, a possible issue in large households. And cooler incoming water in winter typically means your hot water may not be as hot as you like. 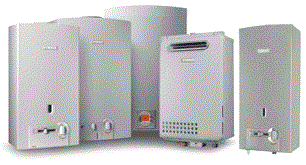 These water heaters are a combination of the electric storage-tank water heaters and a heat pump. The heat pump extracts the air from the surrounding and aids in the heating of the water. As a result, most of the hybrid electric water heater used about 60% less energy when compared to normal storage-tank electric hot water heaters. Although they cost more than electric-only water heaters, they are fairly similar to install and also pay back on a short time. But hybrids also have their downsides. Because the heat pump is usually on top, they need as much as 7 feet clearance from floor to ceiling. You'll also need up to 1,000 cubic feet of uncooled space to capture enough heat from the air, along with a condensate pump (about $150) if there's no drain nearby. Hybrid heaters are noisier than conventional storage-tank heaters, exhaust cool air, and can rob some heated air in winter. All solar heaters supplement an electric heater in basically the same way: A roof-mounted collector absorbs the sun's heat and transfers it to an antifreeze-like fluid in a closed-loop system that runs to the water tank. The collector is typically a flat panel or an array of glass cylinders called evacuated tubes. The best delivered stellar savings in summer, making them an attractive option for warm, sunny areas. One of the most important aspects about solar hot water heaters is that they have a considerably high amount of purchase price compared to other water heaters. It is fairly expensive to have a solar water heater installed, but it does pay off in the long run. By utilizing sun's energy, the operating cost for solar hot water heater reduces by up to 90 percent. Solar water heating systems require a conventional water heater as a backup water heating source to ensure hot water is available when solar energy is not.